Q: How does needlepunch or machine needle felting work? Q: What does needlepunch add to the sewing mix? What do you love most about it? Q: How durable is machine needle felting? 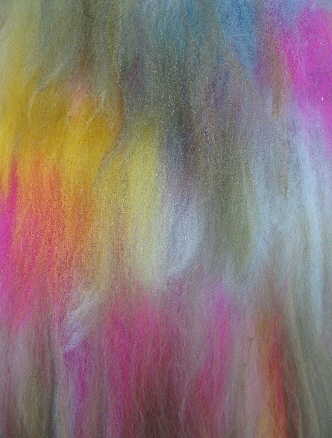 Q: Do all materials need to be able to felt, in order to be used in machine needle felting? Q: Regarding your free tutorial on the Resources page, why do you use a stabilizer on your leaf project? What kind is it? How durable is the leaf? Can you wash it? Could you use a permanent stabilizer or foundation instead? Q: What are some things to consider as I get ready to purchase needlepunch equipment? &A: Needle felting happens because of special barbed needles and the varied effects these create while using them with various materials. It's also true that needles vary throughout the marketplace: due to the gauge of the wire the needle is made from; the shape of the needle itself; the placement and number of barbs it contains; the depth and angle of those barbs; even the length of the needles vary. You see, there are great differences in play with needles, yet they are all designed to basically do the same thing. All brands have these little barbs or hooks, as if with soft shoulders above the hooks. (I think of the tiny hooks on a crab's leg). As barbed needles travel down through layers of fiber, fabric, yarn, etc... the hooks fill and deliver what has been collected under the barbs, to the underside. Then, as if by magic, as the needle withdraws, those “soft shoulders” glide back up and out, withdrawing up, with empty barbs; having deposited what was there just a moment ago. I do love best, working with the BERNINA Rotary Punch needles. I spent many months, testing and designing these with and for BERNINA. My goal? To deliver to you the widest range of exciting and alluring punch effects, with the least amount of damage to most different kinds of base fabrics. We really did it. These needles are, in my opinion THE best in the marketplace ...and I have worked with every brand. Before these became available my favorites were the BERNINA CB needles and the Baby Lock Embellisher needles. &A: I love to sew. I love to embroider. I love new tech and old ways. I love to create free-motion stitch, to piece cloth and assemble all manner of stitched projects. So what does needlepunch add to the mix? For one thing, its surface and coloration is soft and fuzzy-looking. This is especially true underneath your topping application side. That's where a more blurred coloration typically emerges. Nothing else in sewing does blurry so well! I think of it as the wonderful, willful, creative and innocent child of sewing. It knows no right or wrong side to its work! You get to decide. Didn't know what effect was going to emerge while working? Act like you meant to do that. What's right? Well ..the right side is the side you like the best. Plus you have the opportunity to work both sides, applying toppings to either side to achieve just the combo of crisp and blurry you are after. We explore this in detail, in the Fiber Cafe One. I love to blend new colors, and the feel and look of the materials for needlepunch! Here's the main thing that turns me on so much.... You can create new colors and textures simultaneously! It's right brained fabric making. No warp, no weft, no particular sequence of assembly required. It's more like fiber-felted collage, with the additional fun of seeming as pliant as polymer clay. I can build felt in layers, cutting, reassembling, etc. My creative life hasn't been the same since this way of working has been added to my palette. Secretly, I think it's what I had been waiting for... so what could be better? Unlike traditional felting, there's no smooshing or rolling or pounding ... but yes, you can produce "felt." I am all about electricity. YES... for the purists... it is a dry process, but in some sense I feel it not only has the spontaneity of liquids, at least when it comes to color mixing; it actually offers more diverse effects and textures than what can be achieved by wet felting alone. It is capable of producing felt and more. There. I said it. ………oh please put me under glass. Some of my wall pieces are designed to be hand washable. My purses are recommended for either hand wash or gentle machine wash, depending on my choice of ingredients and whether I have added any stitching to some of the less willing materials. My clothing trims are very durable for wash and dry or are removable for separate hand washing. Lots of things I needlepunch can stand up to gentle machine washing, including some kid-friendly materials (for kids to create with or to wear). But not all fiber and textile art needs to withstand washing. I would ask myself, what's necessary to maintain the beauty of this creation based on its purpose? Will it be handled? If it will, adjust for that. Is it archival? Does that matter? If it does, make it happen. Etc. In the Fiber Cafe One you will produce samples that work for the kinds of projects you have in mind! &A: Some of the materials must respond well to the needles, meshing and holding that punch; others don't. So what to do? Combine the unwilling with the willing! In general, fibers are the most felt-able. To discover the potential of various materials, test them out. Fiber content, weave structure and the looseness of the materials all come into play. In general, the looser the material (fiber) and the higher the percentage of animal fiber (wool, silk) the more likely it is to punch well. You can learn to include the use of plant based materials (cotton for example) and synthetics too. Even metallic and ultrasuede fabrics that don't felt at all... can be combined in ways to perform fabulous needlepunch effects. Learn all about this as you master techniques in the Fiber Cafe One! with your own brand of equipment. 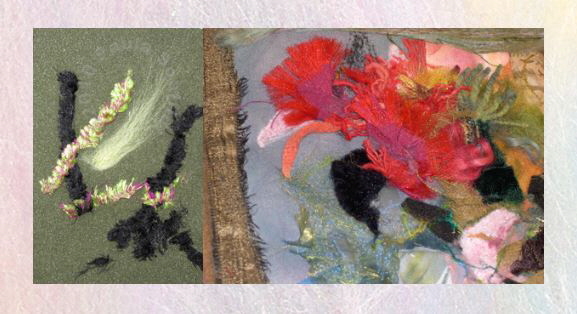 various materials to take advantage of in your textile art. And while many fabrics, fibers and yarns possess characteristic responses to the barbed needles you are working with, some surprises will continue to present new opportunities for fresh techniques. Use a highly felt-able fiber, such as merino, criss-cross your layers repeatedly, and your leaf will be both washable and durable. When using the cotton floss for sharper vein lines, be sure turn your leaf over after first punching the cotton floss into place. This only temporarily holds the cotton in place, because the cotton isn't very felt-able. By turning the leaf over to punch again, the merino wool base of the leaf is punched to partially encase the cotton floss, thereby securing it. Need more security for its use? You can always add some stitch! Yes, it is washable... but like any fabric, you need to pre-wash it the way your finished project will be cared for, in order to insure various elements in your project don't shrink at different rates. With felt or any wool, a good extra step in an important work would be to repeat the pre-wash of choice a couple of times, in case there is any further fulling or shrinking of the wool in a second wash. Then you should be safe. It is interesting to feel how much thicker your motifs will become in different wash and dry methods and temperature settings. The hotter the wash or dry, the more friction, the thicker your motif may become. If you are working with quality fiber from a professional, small or large, dye company... dye molecule bleed should never be an issue! Yes, you can use a permanent stabilizer. 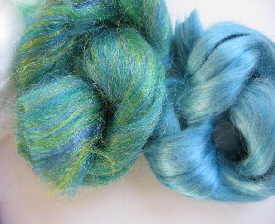 A good choice when your fibers are not mostly wool or silk. Experiment! Make selections based on the amount of drape or body you wish your material to have. Of course adjust your fiber application thickness for this too. Cotton scrim is a very interesting material to use in needlepunch. Do you also have an interest in sewing? Even a small one? Considering budget and the cost of a substantial stand alone machine for needle felting, you may wish to maximize your dollars spent. And if space is also a consideration, something versatile like a sewing machine that will also perform excellent needlepunch would be a terrific option. Also fits the best needles in the market in my opinion: BERNINA CB needles and Rotary Punch needles. OK. I admit it. I'm an unabashed BERNINA fan, who loves creating in my all red studio. And last but not least....The Rotary Punch tool has the only yarn port in the industry that works well, in my opinion. It alone, exclusively, lets you feed novelty yarns right to the needles without tangling. I recommend ...the BERNINA Rotary Punch Tool for all of its top-of-the-line features and the BERNINA CB tool for its wonderful performance and to maximize your dollars spent, by getting a sewing machine too. Though it offers fewer needlepunch features, it is a wonderful too. You can always trade up later, if you really get into it. IMPORTANT! Equipment recommendations aside, I'd love to work with you regardless of your equipment brand, in the first two Fiber Cafe courses I teach techniques you can create on any brand. There will be some variation, but only slight, in the results. When it comes to Fiber Cafe Three, that course is filled with exclusive Rotary Punch Fiberella Techniques. So far, I have developed about 40 Fiberella Techniques suitable for all brands, plus an additional 100 techniques that only the BERNINA Rotary Punch can perform. Already have a sewing machine? Check out a BERNINA 3 series with a CB punch anyway. 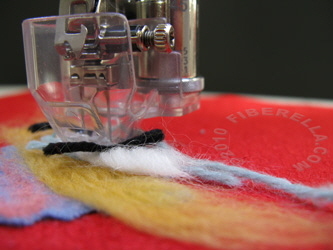 Cost is comparable to quality needle felting stand alone equipment and, the BERNINA offers. detail work in needlepunch, would provide you with an easy sewing and punching machine to take to classes, move around the house, pack for a weekday or weekend get-away. Nice to leave the punch tool set up at times, adjacent other sewing activities. You could also do needlepunch work while embroidering on your other machine. Definitely spring $ for the free-hand system, if you can swing it. Only BERNINA offers this for machine needle felting! It's great. Or consider going straight to a BERNINA higher up the line, a model with a 9mm stitch so you can use the Rotary Punch tool... the best there is, in my opinion. In particular, I have a special love for the 5 and the 8 series models. Online in my Fiber Cafe One and Two eLearning courses, I help all that I can to assure that everyone becomes comfortable with your particular brand of equipment. I have worked on all of them. I routinely offer technique tips so everyone meets success with Fiberella Techniques, and their art making; while using the needle types specific for your machine, and your particular needle configurations, etc. ANNOUNCEMENT! You're among the first to know because you hung in there and read all this! I hope to meet you here!